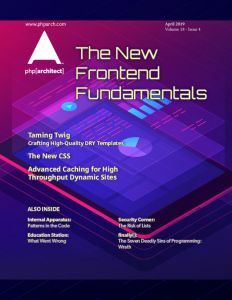 This article was published in the February 2019 issue of php[architect] magazine. See how it looks in the published magazine by downloading the Free Article PDF. All through 2018, I had the same conversations about inclusion, representation, and accessibility with event organizers again and again. Everything from venue accessibility, to Codes of Conduct issues, to representation—every organizer was starting from square one on at least some of the concerns most important to underrepresented developer communities. Looking at the perpetual churn of community volunteers putting together events I realized this was an inevitable ongoing issue and needed an ongoing solution which could scale in a way my one-on-one conversations could not. One of my favorite things to do with code is to facilitate emotional labor, so inevitably I decided to write an app to streamline this process. This was the genesis of what the Twilio Developer Evangelism team has come to call our new sponsorship framework. We already had a way to evaluate events for sponsorship, and we still have to rely on our own evaluation and judgment. However, this adds an additional layer of intentionality specifically around inclusion, representation, and accessibility to that evaluation. The basic idea of the framework is simple: there are a set of minimum efforts and a variety of more advanced efforts defined. Organizers fill out a form which tells us about their plans in relation to those things. A bit of code grabs that info and turns it into a summary and recommendation which is emailed to the Developer Evangelist the organizer indicated on the form. This recommendation (Figure 1)is not only a useful way to surface important efforts from a specific event, but it also can give you a rubric through which you can create a system of positive incentives to encourage events to become even more inclusive! I came to this project with a lot of pre-existing knowledge in the domain, but it wasn’t sufficient to create a framework inclusive enough to inspire and equip the diverse array of organizers and sponsors working in our developer communities. Luckily, I didn’t have to do this alone! The standards that make up this initial version of the framework came together through the generous contribution of countless hours of conversation, emails, shared articles, and event experiences. This has truly been a community project, and I am endlessly grateful for the amazing generosity with which people have given and continue to give to this effort. It’s our hope that other organizations which sponsor and host events will decide to make use of the framework in whatever ways make sense for them. The content of the framework strives to find a balance between what underrepresented developers need and what organizers can accomplish with limited resources. To test that balance, I asked Heather and Eli White with One for All Events to test run a draft version of the framework last November. As part of that process, I interviewed Eli about their experiences incorporating diversity and inclusion efforts into tech events. Q: How long have you been organizing events? EW: Full-time since 2013, and I organized one previous tech event for a company in 2009, and helped organize many small non-profit educational events (non-tech) for many years before that. Q: How are inclusion concerns important to you? EW: It’s important for our events to appeal to everyone and feel welcoming for many (highly interrelated) reasons. It’s important that no one ever feel unwelcome or unwanted at one of our events. We want to make sure the event has a purpose (tech education or gaming fun), and that the purpose is what is your main concern while there. Not whether you’ll be accepted or feel out of place. Whether that’s because of a demographic, an allergy, or anything that might otherwise make it harder for you to attend. Also, I’ll honestly admit that a side effect of that, is increasing attendance overall! It’s extremely important for events to be financially whole, and having low attendance because of a segment of the population feeling excluded and therefore not wanting to attend, can scuttle an event as easily as any other major failing. Q: Have you attempted any changes or efforts that you’ve noticed having an effect on people’s experience? EW: Yes, even things as simple as hand picking more speakers who are just as skilled but happen to be from diverse backgrounds, and having website design be friendly and welcoming, can quickly (year to year) start showing that everyone is welcome and encouraged to attend—causing your audience to be more diverse overall. Q: While you’ve been looking at, learning about, and making efforts to address inclusion, what have been your biggest surprises? EW: I think one of the biggest surprises has been the small steps that help. As I mentioned, even just doing some of the smaller things, like making sure your website has photos from previous years that showcase the diversity you have had in the past, can quickly lead to a more diverse audience year over year. On the flip side, I think one of the other biggest surprises is how hard it still is. It’s a very complicated topic that is constantly changing/morphing at every step. It’s extremely important to work on, but can be exhausting. Q: Do you have any hopes and/or goals for yourself, your events, events in general, and/or the greater community when it comes to inclusion moving forward? EW: Yes, for all our events we are striving hard to make it so everyone feels welcome. And to raise the percent attendance at our events to more properly match the community and society itself. It’s a long road ahead of us, but we are working to make some great partners to help us with that. The framework aspires to shoulder some of the mental labor required to put on more inclusive events. Developer Evangelists are able to surface and quickly evaluate efforts that matter most to the communities they’re serving. Organizers get a thoughtfully curated collection of efforts which can make their events more inclusive, representative, and accessible. Many of the more advanced efforts include an option for organizers to request more information on how to implement it. These requests for information are one of the things surfaced and highlighted in the report to the Developer Evangelist. They can then reach out directly to the organizer. Neither the framework nor the CLI tool is intended to remain static. As more organizers go through the process and more Developer Evangelists utilize the tools, things will evolve to reflect what we learn. The feedback from organizers is already tremendous. The priorities it represents resonate strongly with a lot of people already doing amazing work to serve these communities. It’s been an honor to hear how this has made organizers feel like their efforts are seen, and to watch their great ideas spread through the framework. Plans already in the works for the CLI tool include tests(! ), automatically adding events to our event tracking tool, the addition of an interactive checklist to facilitate evaluating events based on the plans indicated and tracking event efforts over time. If you decide to implement the framework with your organization, we’d love to hear about it!